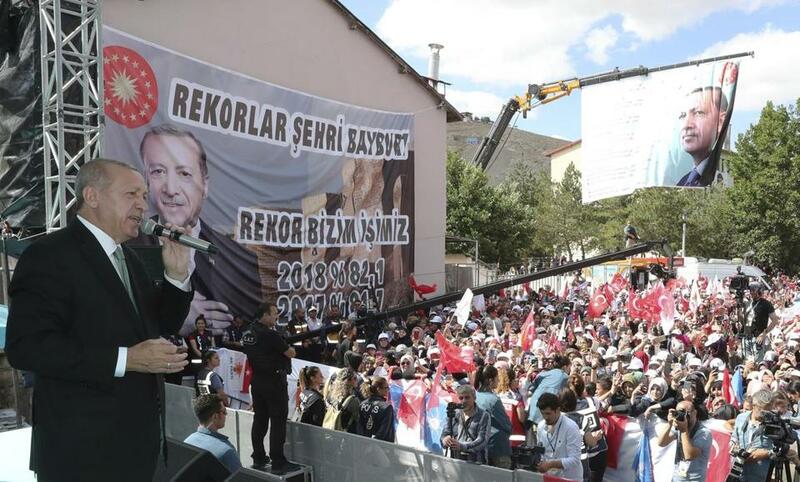 Turkey&apos;s President Recep Tayyip Erdogan addressed a rally of his supporters in Bayburt, Turkey, on Friday. Turkey’s currency plunged Friday — accelerated by a hostile tweet from President Donald Trump — causing financial markets to tremble and showing that the country is as much a risk to the world economy as it is a geopolitical flashpoint. Internal political turmoil, soaring inflation, and conflict with Trump over a jailed American pastor have combined to destroy confidence in the Turkish lira, which lost 20 percent of its value against the dollar at one point Friday. There is fear among foreign investors that President Recep Tayyip Erdogan is pursuing irresponsible economic policies while undercutting the independence of the central bank. That, analysts fear, is preventing the country from taking necessary steps to put the economy on more stable footing. Trump aggravated an already dire situation when he said that he would double tariffs on imported Turkish steel to 50 percent and on aluminum to 20 percent. The move seemed to be in retaliation for Turkey’s refusal to release an American pastor, Andrew Brunson, detained during a crackdown after a failed coup attempt in 2016. The move effectively prices Turkish steel out of the US market, which accounting for 13 percent of Turkey’s steel exports. Trump’s hostility toward a NATO ally that borders Iran and Syria increases the risk Turkey’s problems could destabilize economies well beyond the region. The sharp decline of the lira, and worries over the wider consequences of Turkey’s economic turmoil, helped drive the main stock indexes in Tokyo, Frankfurt, and Paris more than 1 percent lower. On Friday Erdogan continued to blame foreigners for the country’s problems. His combative comments on national television were seen as a signal that he is not likely to change the policies that have undercut the lira’s value, pushed inflation close to 16 percent and made bank loans prohibitively expensive. With its currency weakening, Turkey must pay more for imported oil and other goods. That leads to higher inflation, causing the lira to fall even more. Without steep increases in central bank interest rates and cuts in government spending — moves Erdogan has so far refused — the country could suffer hyperinflation and economic collapse. The lira’s sharp decline has reflected concerns about the fundamentals of Erdogan’s economic model, which has depended on a voracious construction industry that his opponents say has enriched his inner circle while heaping debt on the country. The currency continued to fall after Erdogan acquired sweeping executive powers with his re-election in June, amid concerns the strong-willed president is taking no one’s economic advice but his own; he has resisted calls to raise interest rates to curb inflation and to ease pressure on the lira. Investors fear banks in Asia and Europe could suffer because they have invested in Turkish assets, and those problems could then spread to other sectors of the economy. Erdogan dismissed such concerns. In a speech Thursday, he insisted Turkey would weather the current storm. “Don’t forget, if they have the dollar, we have our people, our Allah,” Erdogan said.